Are you scratching your head as to why I would do a Modern Powder Bath Vanity Round-Up when I just finished the $100 Challenge Bathroom Makeover? My mind is constantly thinking about five different projects at once. If you read my House Project Goals for 2018, then you might remember that one of our goals for the year is to GUT our powder bathroom. I don’t want you all to get too excited yet because we aren’t quite ready to tackle the grunt work of the space, but the planning, sourcing and ordering part of the project has started. I thought it might be fun for you to walk through the whole process with me. How I do a space and in what order I do the space with planning, sourcing, ordering, and then actually renovating the space. Before I jump right into the modern vanity round-up options, you have to see the gross before. Cover your eyes if you don’t want to see ugly wallpaper, a dingy vanity and CARPET in the powder bathroom. Extra points if you spy the foam missile! Ha! So, this space, to give you context, is on the entryway level right off the laundry room (you can see a reflection of the laundry room in the mirror). To get to the powder bath, you have to go through the small laundry room from the entryway or from the sunroom. It’s a very small space. 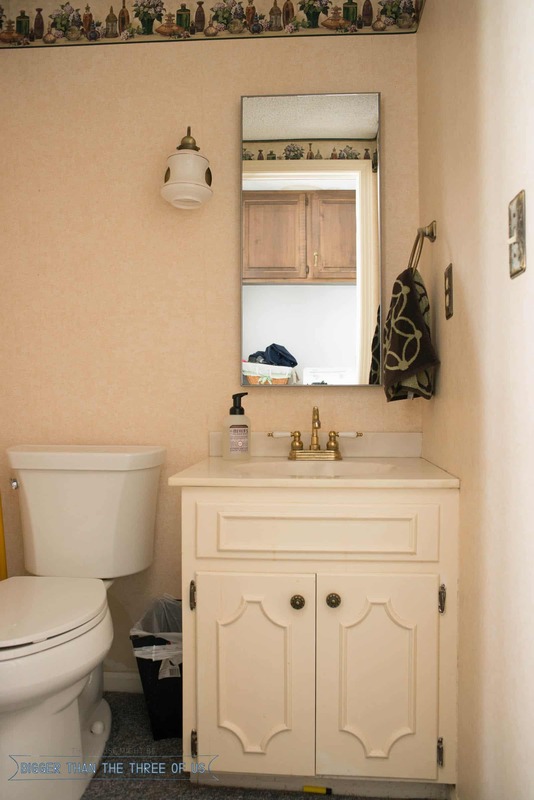 Ok, so now that you’ve seen one picture of the original space, let’s chat a bit about the bathroom vanities and why I’m starting the makeover with picking out the vanity. The powder bath is small and small modern vanities (in my budget) are hard to find. So, I knew I wanted to pick the vanity first because I was going to have less options for it. To start my project, I created a Powder Bath board on Pinterest where I curated options that I loved and thought might work with my powder bath. From there, I had a pretty good idea of what I wanted my space to look like. Sconces, tile, mirrors, art, and wall treatments are all things that I find and love all the time. Modern bathroom vanities are not pieces that I find and love. SO, for me the jumping off part of this bathroom renovation was to find the vanity first. Vanity sizes completely vary and they also vary in height. 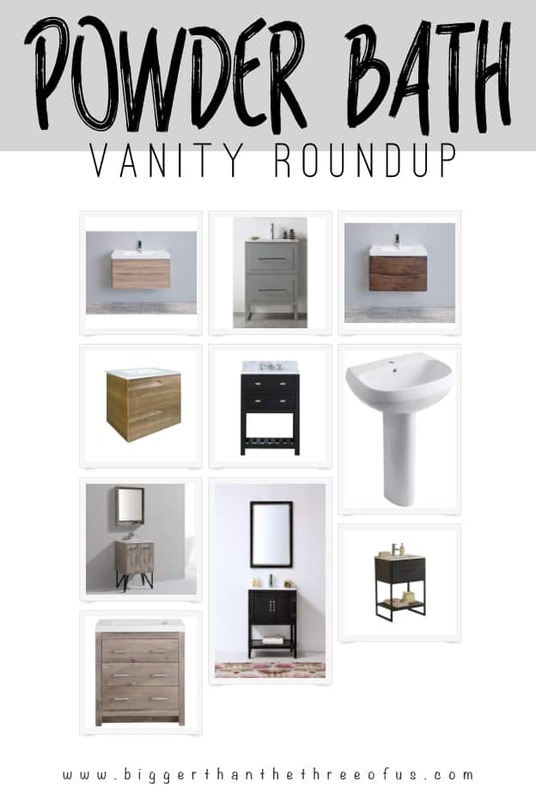 For this round-up, I’ve included vanities that are mostly under 27″ but there is one on there that I believe is 31″. I was looking for a piece that was modern and I was open to changing out the hardware on the piece to make it have the look that I wanted. For example, two of those black vanities had polished chrome hardware. Polished chrome is fine, but it’s not what I want so changing out just the hardware would give the piece a completely different look. I was also open to painting the cabinet if I had to. I actually really liked the profile of the greenish-blue vanity but didn’t like the color. Painting the piece would have given me the profile and color that I liked. Ultimately though, I wanted to bring some wood tones into the space. Since the powder bath is tiny, I also thought that a wall-mounted vanity would be a perfect choice. I ended up picking the wall-mounted Walnut vanity from Overstock. It came in about a month ago in white… they sent me the wrong one! So, I had to work with them to get the right one but it’s here now and I’m excited about it! Like I mentioned earlier, we aren’t ready to tackle this space, but having the vanity here is one step in the right direction. Since I’m taking you through the process of how I design, order and renovate during this project… I think the next post will contain all the before pictures and a design board for the space. I hope you are looking forward to it.